Pennsylvania Maple Syrup Producers Council – "Real Maple Syrup, a Natural and Nutritious Choice"
"Real Maple Syrup, a Natural and Nutritious Choice"
There are many different kinds of trees in the Pennsylvania’s forests, but the sweetest tree in Pennsylvania is the sugar maple. The sap from this tree is used to make pure maple syrup. Sugar maple trees are unique to North America and grow naturally only in the northeastern United States and southeastern Canada. This makes maple syrup a very special product that we get from Pennsylvania forests. 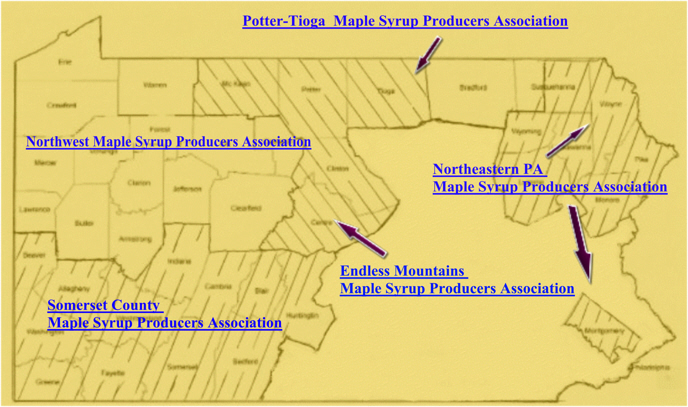 The Pennsylvania Maple Syrup Producers Council Inc. is made up of five member associations.